GILROY, CA – Former Three-time World Champion, Robert “The Ghost” Guerrero (27-1-1, 18 KOs), has stepped up his training camp in preparation for his upcoming showdown with 2004 Olympian, Vicente Escobedo (22-2, 14 KOs). 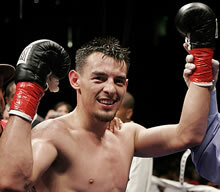 Guerrero and Escobedo both hail from Northern California and faced each other three times as amateurs. This bout will be their first meeting as professionals. Robert Guerrero vs. Vicente Escobedo, a title elimination bout, is scheduled for Saturday, November 6, on HBO Boxing After Dark. For more information visit www.goldenboypromotions.com.